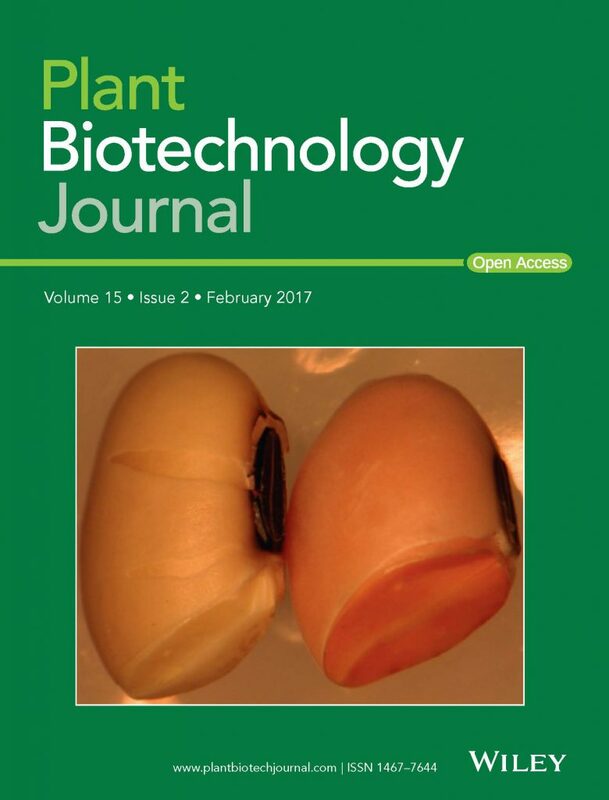 On the Cover: Immature soybean embryo, late stage development, harboring a transgenic allele that carries a three gene stack for the synthesis of keto-carotenoids (right), along with corresponding control (left). Hyunwoo Park, Steven Weier, Fareha Razvi, Pamela A. Pena, Neil A. Sims, Jennica Lowell, Cory Hungate, Karma Kissinger, Gavin Key, Paul Fraser, Johnathan A. Napier, Edgar B. Cahoon, Tom E. Clemente. February 2017. Towards the development of a sustainable soya bean-based feedstock for aquaculture. Plant Biotechnology Journal 15(2), pp. 227-236. Hyunwoo Park was a postdoctoral research associate in the Center for Plant Science Innovation. Steven Weier is general manager of pilot plants in the Department of Food Science and Technology’s Food Processing Center. Fareha Razvi was a postdoctoral research associate in the Center for Plant Science Innovation. Pamela Pena is a postdoctoral research associate in the Center for Plant Science Innovation. Edgar Cahoon is the George W. Holmes Professor of Biochemistry and director of the Center for Plant Science Innovation. Tom Clemente is the Eugene W. Price Distinguished Professor of Biotechnology in the Center for Plant Science Innovation.